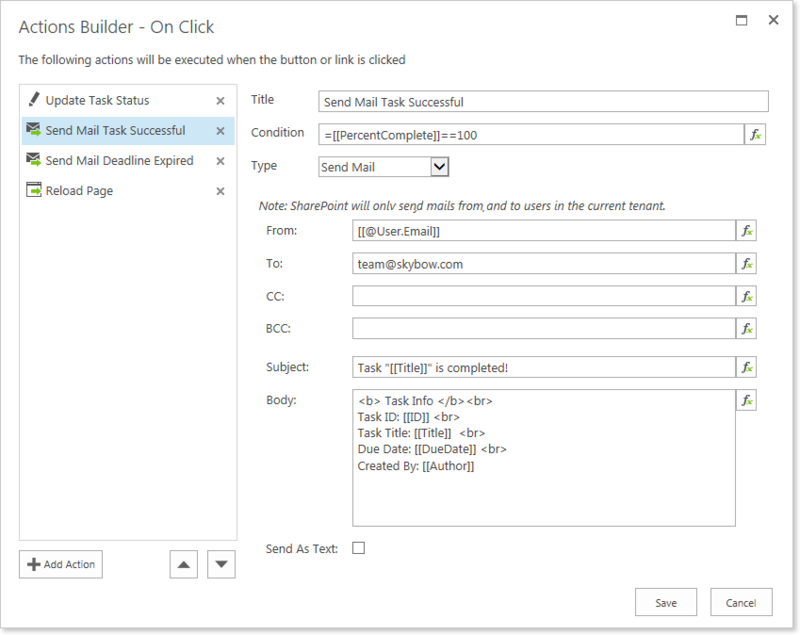 Actions Builder is a tool that allows to specify the actions for the configured links. The Actions Builder dialog consists of two parts: the list of actions and the list of properties according to the selected action. To add an action, click the 'Add Action' button. Title: Title to be displayed for the action in the list of actions. This is only to easily identify the actions in the list. Condition: Define a case when the action should be executed. Expression-based values for the Condition field can be easily set using the placeholders available in Expression Builder. Type: Defines the type of action to execute. Depending on the selected type, each action link has additional properties. Actions are executed one by one in the order they are shown in the left hand list. To change the order of the actions, use the appropriate Up and Down arrow buttons.